As most would agree, the Kitchen is THE room inside of your home that is most important and critical to get right for the sale of your home to Buyers. As we have discussed in my previous Home Staging Tips for Quick Sale series: Home Staging Tips for Quick Sale– Curb Appeal and Home Staging Tips for Quick Sale– Walking through the Front Door, the principal idea in all staging a home for sale is appealing to the Buyers 5 senses. A starting rule of thumb on what to spend ($) when remodeling or improving your kitchen should be 10 – 15% of the value. 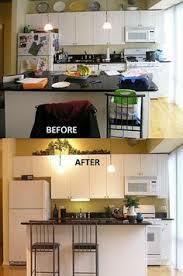 According to a recent survey, 80% of home buyers placed the kitchen in their list of top three most important spaces. And of buyers who bought homes without certain features, 69% of those surveyed said they would have paid more for new appliances and 55% said they would have paid more for granite counters. As stated in earlier Blogs, it is often simple and cost effective measures that make a world of difference. As you can see, removal of refrigerator art and clutter represent a huge difference. 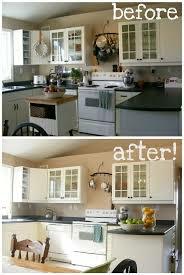 Putting small appliances in your cabinets increases the visual size of your counter tops. This would also include cutting boards, knife sets, dish caddies, dish soaps, sponges and cleaning paraphernalia. Lighting is very important… Replace bulbs with high watt bulbs take down or replace sun stealing window hangings. Trash cans should be put out of sight and DO NOT have Kitty Litter anywhere near the Kitchen. Minimize personal touches such as photographs, as you can see in these pictures – less is more.